Hazel Stansfield, 21, works for NFU Mutual in insurance sales after finishing her apprenticeship last month. She is also vice-chairwoman and secretary at Clitheroe Young Farmers Club. Agriculture: Each working day is different and I spend my time meeting the demands of each individual client. Personally I am busy working through learning so I can get licensed in my commercial select policies, business and farms. To be completely honest, I sort of fell into my job at Alpes, a butchers, working on a Saturday washing up for a couple of hours. Fast forward a couple of years and I found myself getting so interested in butchery, I ended up working there full-time. There was real job satisfaction from seeing the carcase come into the shop, to putting it in the counter as the end product and selling it. So why the career change from butchery, a hands-on profession, to working in an office? If you have ever been a butcher at Christmas you will know why. But NFU Mutual has many opportunities and career paths and it is a privilege to work for them. I do not fancy taking over my dad’s foot-trimming business. I will leave that to my younger brother. I would have never have been offered the role at the NFU. I have been a member of Clitheroe YFC since 2015 and if there is one thing I regret, it is not joining sooner. Last membership year, Clitheroe YFC raised £10,750 for charity, the main event being a tractor run in memory of fellow Clitheroe member and former Farmers Guardian journalist Louise Hartley. 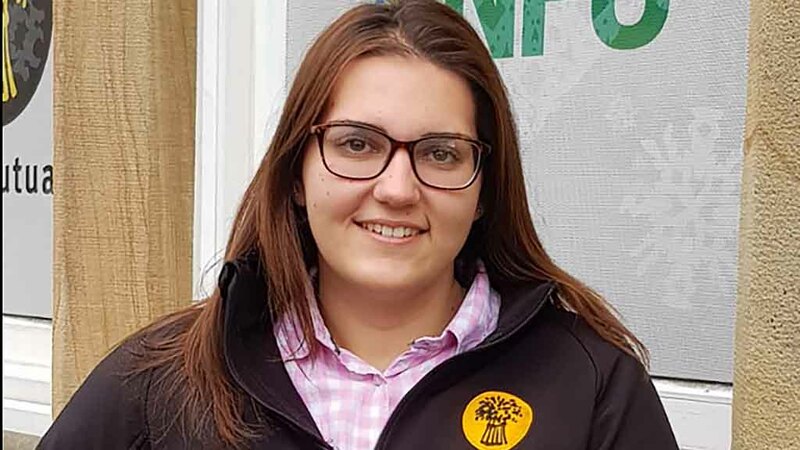 Sri Lanka: I was fortunate to be placed on a two-week volunteering trip to Sri Lanka with the National Federation of Young Farmers Clubs, due to fly out in August this year with nine other Young Farmers. In the first week, we will be creating a garden for a care centre near Colombo, doing everything from planting to sustainability and nutrition workshops. We will work alongside local farmers who are key in producing jackfruit curry and mango juice, encouraging them to use sustainable, organic methods. To fund the trip, I am hosting a frog racing night at Hurst Green Village Hall, Clitheroe, on March 23. It will be an evening full of racing, betting and supper, finishing with a DJ and a boogie. To buy a ticket please get in touch on 07757 667 253.